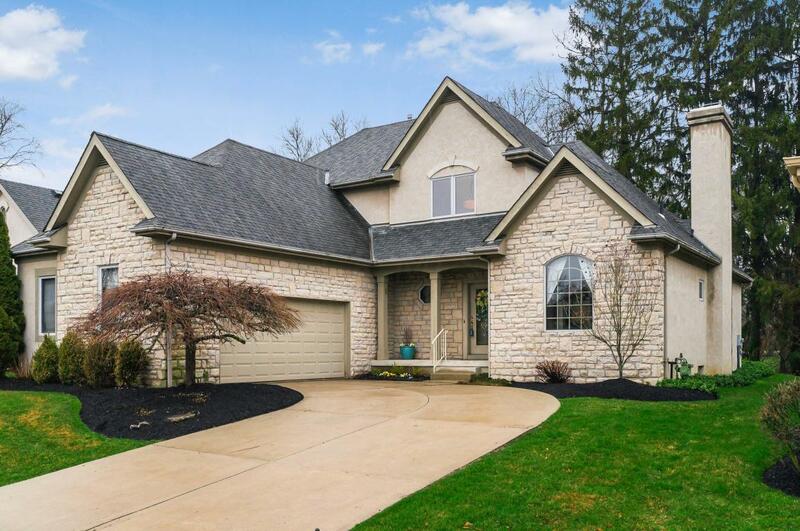 Wonderful Patio Home in fantastic neighborhood just North of Bethel Rd off Olentangy. High open rooms, rich dark cherry stained woodwork and floors, wide 9 inch moldings, solid panel doors. Huge front window in Dining Rm. Great Rm w/gas FPLC, solid mantle opens to den w/blt-ins. Cherry Kitchen w/eating bar & granite tiled counters opens to sunny dinette. 1st Fl Master, Deluxe bath w/separate vanities, jetted tub & lg shower. 16' walk-in closet with pass-through to utility room. Two HUGE bedrooms up, each with walk-in closets. 21x22 finished room in bsmt. Grill out on private patio with inground fountain, backing to mature trees! HOA does all lawn care, mulch, grass cutting, irrigation startup & winterization. Private Area Park just steps away! New Cent Air 2008, Roof 2006, New Paint 2018.